-CTT stands for Carrying To Term. 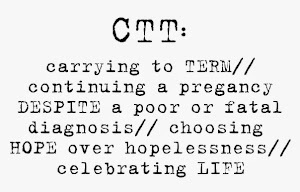 CTT is the choice to continue a pregnancy despite a poor or fatal prenatal diagnosis. What is pregnancy interruption?-Essentially it's abortion for a medical reason, such as poor health of the baby or in more rare cases, high risk to the health of the mother. Procedures vary depending on where you live, and the gestational age of your baby. If you choose to end your pregnancy in your 2nd trimester, most likely your labor will be induced. D&C is another option. Does a woman have to end a pregnancy if they determine the baby is unhealthy or his condition is "incompatible with life"?-No. You always have the option to CTT no matter how sick your baby is. Some doctors encourage termination or present it as the only logical option, however if you decline, they cannot force you to end your pregnancy. Is there a risk to the mother's health if she carries a sick baby?-Every pregnancy is different. However carrying an unhealthy baby, even one not expected to survive, generally does not pose a greater risk to the mother's health than a normal pregnancy would. All pregnant women face health risks such as gestational diabetes, pre-eclampsia and infection, regardless of the health of the baby. There are some fetal conditions that can cause side effects such as too much amniotic fluid which will cause discomfort to the mother and she may need treatments to relieve the pain. Also, the mother may need to be put on bedrest or hospitalized to monitor fetal health. You will need to discuss your specific case with your doctor to learn of any potential maternal health risks. Can babies with poor or fatal prenatal diagnoses ever survive?-Of course, there is always the possibility, though in most cases the chance of long term survival is very slim. Rates of mortality and life expectancy vary based on the specific condition your baby has and you will need to discuss your baby's case with your doctor. Keep in mind that a lot of babies surprise doctors by surviving not only labor and delivery, but living for minutes, hours and even weeks post-birth. A lot of parents describe this time as an invaluable gift. 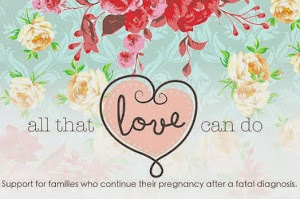 Can mothers who experience a loss of a pregnancy or baby, have healthy children in the future?-Plenty of mothers who have experienced the loss of a baby go on to have perfectly healthy children. However certain genetic conditions and other factors may reduce the likelihood for some couples. Any questions regarding subsequent pregnancies should be discussed with a doctor and/or a genetic counselor prior to TTC after a loss. When will I have to decide whether I'm going to CTT or terminate?-It varies by state and you will need to ask your doctor to be certain. Most doctors consider a baby viable at 24 weeks and won't perform an abortion or induction once you reach the 24 week mark. Your doctor will be able to tell you your options.